Any mention of Hawaii Calls by Ho`olohe Hou Radio creator/host Bill Wynne should be considered ironic as he would be the first to admit that he did not appreciate the sounds of this radio program as a child when it was a favorite of his father. 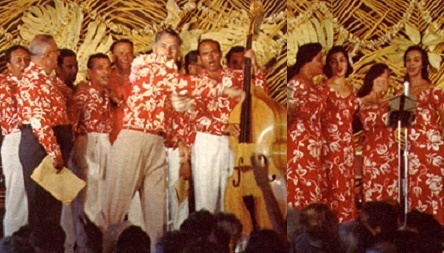 It took many years for Wynne to gain an appreciation for these old school sounds of a bygone era in Hawai`i’s entertainment history, and at some point, it became one of his favorite sounds and favorite subjects. Now Wynne is considered one of the experts on the Hawaii Calls program and its many stars including Benny Kalama, Alfred Apaka, Haunani Kahalewai, Nina Keali`iwahamana, Boyce Rodrigues, Lani Custino, Jules Ah See, Sonny Nicholas, Barney Isaacs, Jimmy Kaopuiki, Pua Almeida, Ed Kenney, Sonny Kamahele, and countless other legends. The Ho`olohe Hou Radio archives are home to nearly 300 of the original 2,000+ episodes. And Wynne is proud to give new life to these classic recordings again. Now there are three chances to catch Hawaii Calls every Saturday on Ho`olohe Hou Radio. Subscribe to our Facebook or Twitter feeds for reminders of when these recordings will go to air and the artists to be featured each week.